Wedding Dessert tables have evolved immensely over the past decade. 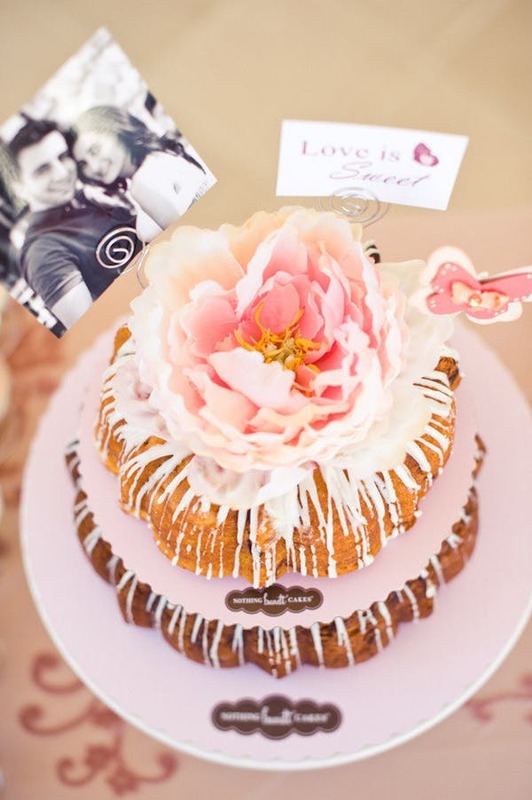 Brides are becoming increasingly creative with the delectable treats that they make available to their guests. Some are opting out of cake entirely and opting in for a sugary sweet glazed donut tower instead. From towers to walls, to elegant displays, brides love their donuts. I've even started to see pretzel walls take weddings by storm! I have to say, I am a huge fan of soft pretzels and this whole pretzel wall wedding trend....let's just say I am HERE for it. But, that's not the only trend I'm excited about. Despite all of the new innovative ideas for donut and pretzel walls, there's a new type of wedding dessert in town and it's getting us back to a little bit of tradition, but with a twist. What am I talking about? BUNDT CAKES! Who would have thought? There have been all kinds of wedding cake trends. Marble cakes, naked cakes, even watercolor cakes, but bundt cakes? That's a new one. And we are a HUGE fan! And you should be too. We'll show you why. This cake is for the fan of frosting in moderation. For those of you that like your frosting in moderation, rather than a corner piece of wedding cake smothered in extra buttercream icing, the bundt cake might be a good option for you. Bundt cakes from Nothing Bundt Cakes, located right here in Indianapolis, are iced intricately in rows of cream cheese icing all around the cake. It's enough to give you that frosting taste, but not so much that it overpowers the whole cake. Bundt cakes are EASY to decorate. Bundt cakes don't need much fancy decorating to stand out to the crowd. With their unique shape, they are already sure to be a sugary showstopper. If you want to give it that extra sparkle, add some flowers! The hole in the center of the cake provides the perfect space to use your creative eye and green thumb to give that cake and extra earthy pizazz that tops it right off. This little hole in the cake is so handy and makes it so simple to decorate. Trust me, you won't need to hire a professional to do this. You can DIY that bundt cake alllll day long. Bundt cakes are a modern twist on a classic wedding tradition. If you're wanting to do something different but you're still an avid cake lover, this dessert gives you the best of both worlds. You still get to have the moist, gooey cake taste that we all love, topped with sweet cream cheese icing. That wedding cake taste is a true tradition, but you don't have to stick to the classics to get that taste. With a bundt cake you can have all that and more, but just in a different, more creative shape. Sounds like a good deal to us! Bundt cakes taste like heaven. Wow, we haven't even gotten to the taste yet, which is really the most important part! If you do a cake tasting with Nothing Bundt Cakes in Indianapolis, it's going to take you some time to narrow down the flavors, I'm not kidding. Because they are just THAT GOOD. The unique thing about Nothing Bundt Cakes is that you can order a whole batch of mini bundt cakes to sample. If you decide on a cake flavor you want, you are credited for the order you paid for and are given the sampling for free and your money will now go towards paying for your actual wedding bundt cake. It's so simple! And who doesn't love sampling a bunch of cute little bundts that they call "bundtinis"?! Seriously it's adorable and I'm obsessed. If you aren't convicned yet, check out these other bundt cakes and see for yourself just how good they look at a wedding! And don't forget to stop by Nothing Bundt Cakes and try a bundt for yourself. They have virtually any flavor your heart could desire. From classic vanilla to confetti or, my personal favorite, white chocolate raspberry, they have it all! Click here to order your bundt cake today! All cakes featured here are by Nothing Bundt Cakes!